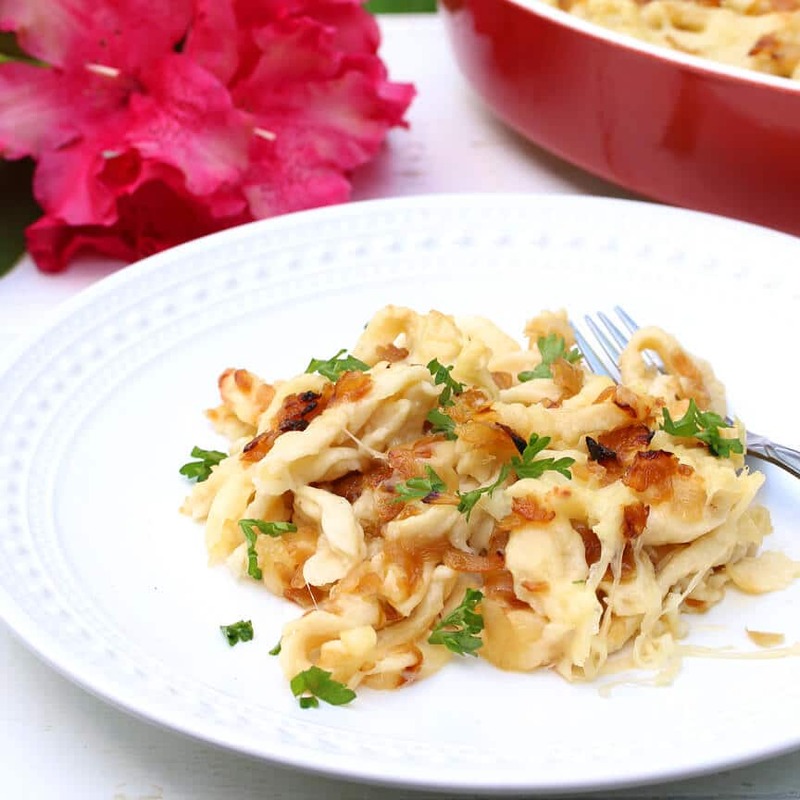 One of the most beloved of all Swabian dishes, Käsespätzle (German Cheese Spaetzle) is everything great comfort food should be! Where I’m from in Stuttgart, Germany this dish is a classic – a quintessential Swabian comfort food dish. 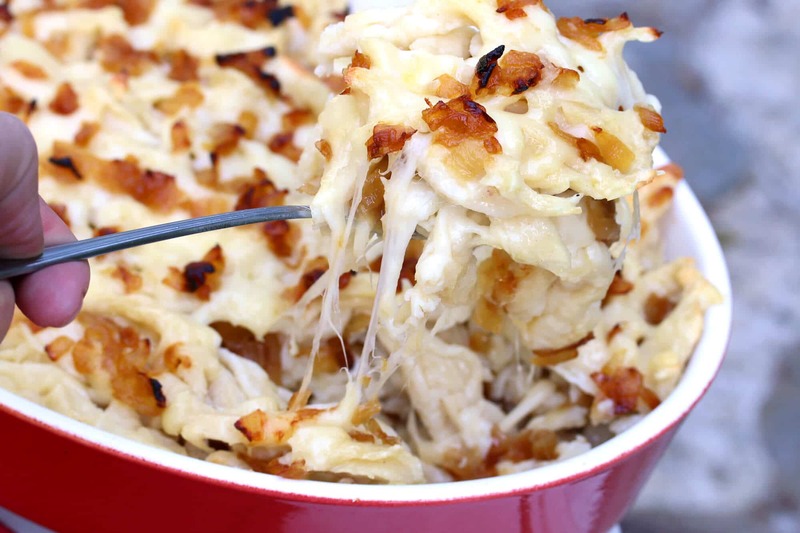 Homemade Spätzle are layered with gobs of shredded Emmentaler and geröstete Zwiebeln (caramelized onions) and then baked in the oven. I guess you could say it’s Germany’s version of mac and cheese. 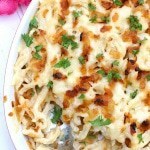 Käsespätzle was a favorite dish in our home and we always looked forward to it when my mom would make it. Though Bavarian by birth she’ll freely admit that Swabian cuisine is Germany’s best. And I couldn’t agree more. Nothing, and I mean nothing, compares to homemade Spätzle. The biggest difference is the texture but the flavor also can’t compare. I don’t think we ever used the bought stuff in our home, we always made them from scratch. I have many memories of my brother and I helping her make Spätzle for this dish and others. Though using the board and scraper method is traditional, most Germans prefer the convenience (and speed) of a Spätzle press, and that’s what we’ve always used. 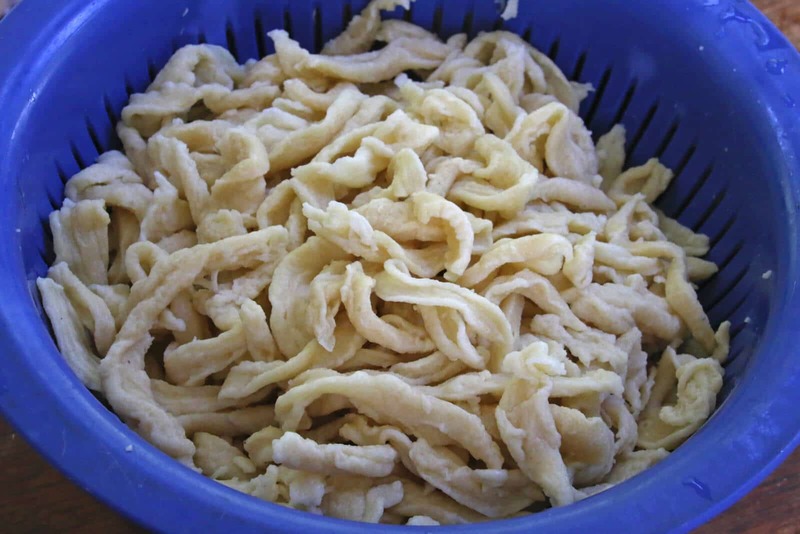 For this Kaese Spaetzle, however, I made them using the old-fashioned way with the Spaetzle board and scraper. But not exactly by choice – we recently moved to our new home and I still haven’t located the box with my Spaetzle press. So today you’re getting the traditional, bona fide Schwäbische Käsespätzle! 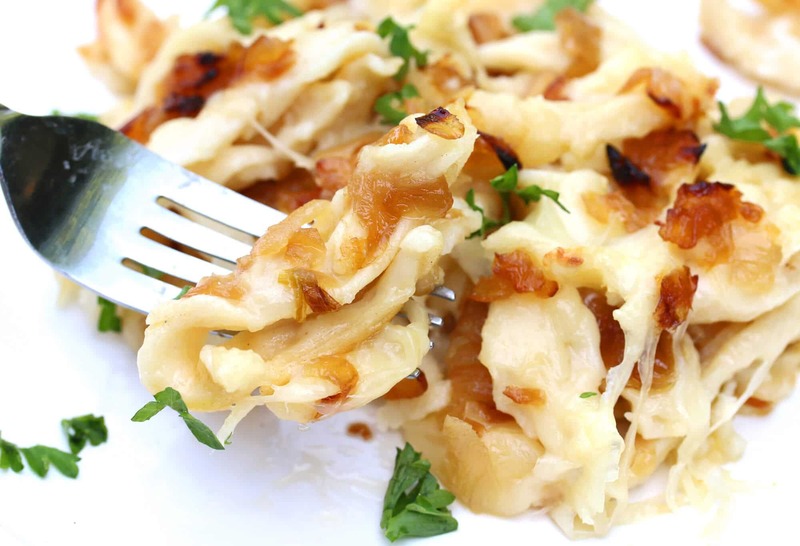 Chewy homemade German egg noodles with caramelized onions and oozing Swiss cheese……. Comfort food really doesn’t get any better! We had this for dinner and the next morning our 3 year old daughter requested it for breakfast! You’ve never heard so many exclamations of “oooh” and “yummmyyyy” before. She’s taking after her mommy and Omi – our sweet little German girl. 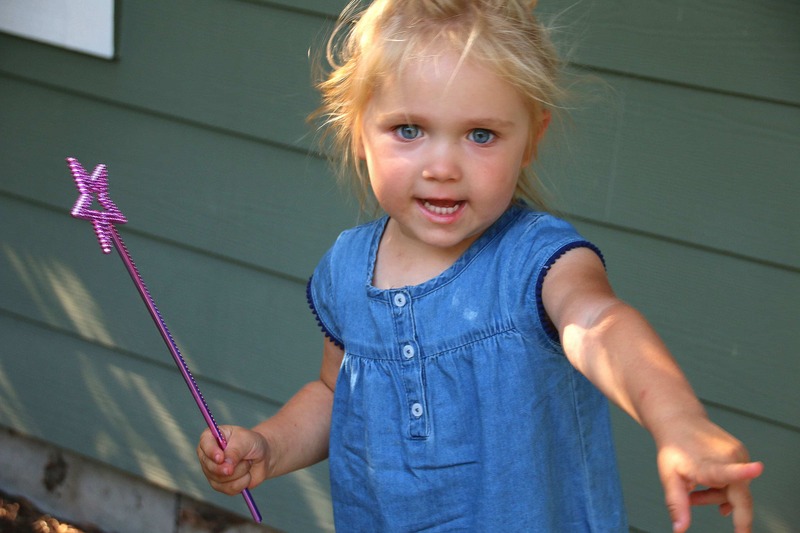 She even devoured every last bit of caramelized onion and then went about her play, zapping things with her magic wand. If you’d like to know more about Spätzle, southern Germany, and how to make the best homemade Spätzle, see my post for Homemade German Spätzle. Ready to make some Käsespätzle? 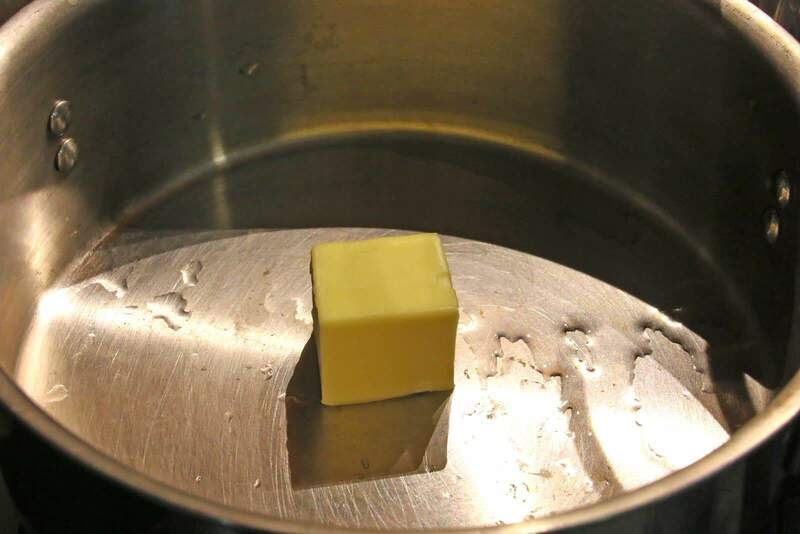 Melt the butter in a medium-sized heavy stock pot or Dutch oven. Add the onions and stir occasionally for 20-30 minutes until deeply caramelized. Halfways into it sprinkle with a little salt and sugar to help with the caramelizing. Get them really nice and brown. While the onions are cooking make the Spätzle. Make one batch of my Homemade German Spätzle. Set the Spätzle aside until ready to use (they can be made in advance and refrigerated until ready to use). Käsespätzle is only as good as the quality of Swiss cheese you use. Do yourself a favor and get the good stuff. No, the American Swiss cheese just doesn’t cut it. Get some European-imported Swiss cheese. Emmentaler and Jarlsberg are both good options. I often like to combine it with some strong Gruyere for extra flavor. 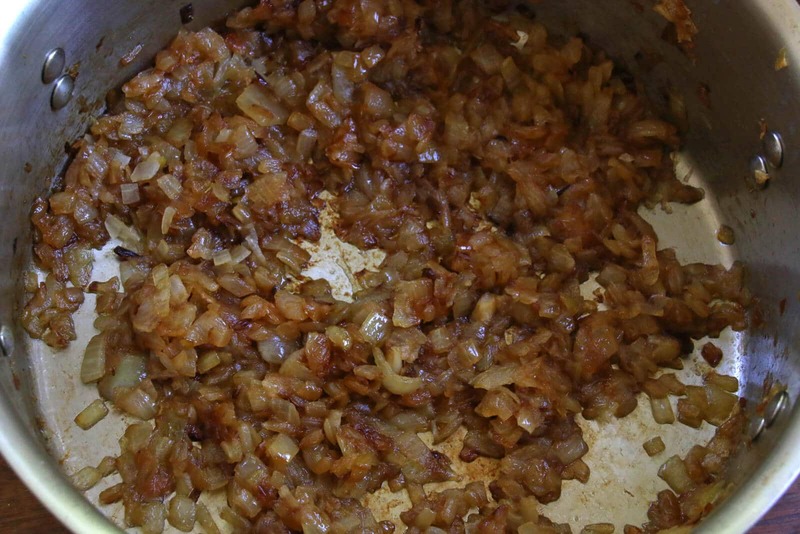 The other key: Lots and lots of deeply caramelized onions. Don’t skimp on these. 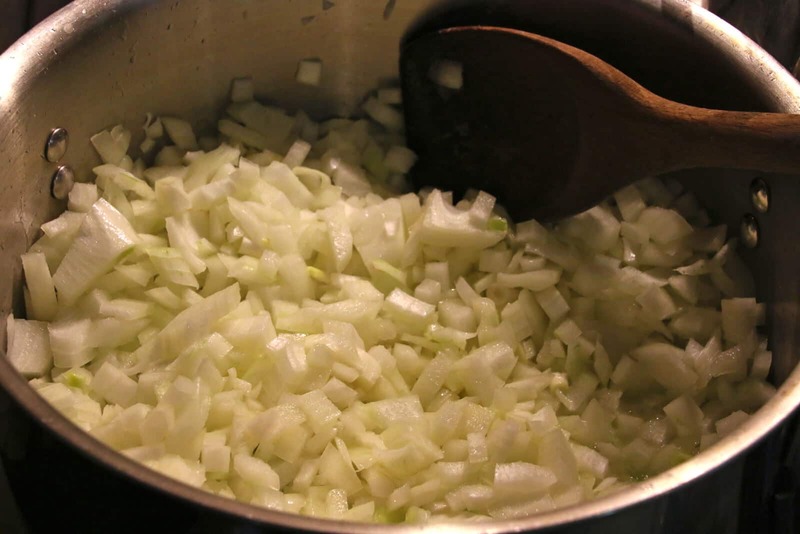 Use two jumbo-sized onions. The more caramelized onions, the better the Käsepätzle will be. Butter a 9×13 (or slightly smaller) casserole dish. 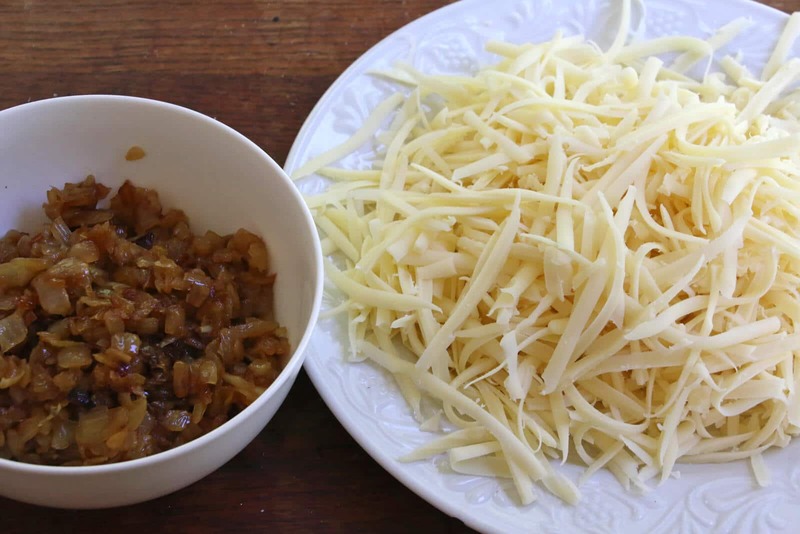 Place a third of the Spätzle in the bottom of dish, followed by a third of the cheese and a third of the caramelized onions. Sprinkle some salt over each layer. Repeat until you’ve completed all the layers, ending with the cheese and the onions on top. Bake the Spätzle uncovered at 400 degrees F for about 10 minutes or until the cheese is melted and the some of the edges have just started to get crispy. Serve immediately. A light sprinkling of chopped parsley always adds a bit of color and class. 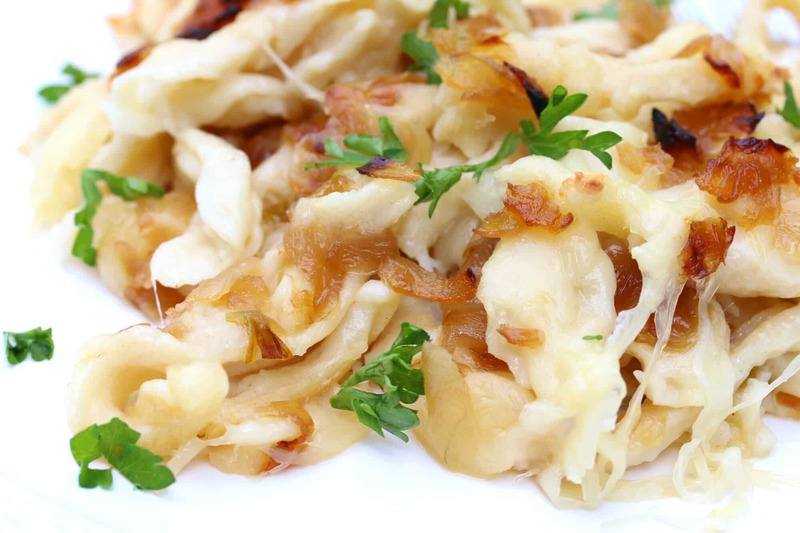 Delicious homemade Spätzle are baked with oozing cheese and topped with caramelized onions. It's a favorite from Swabia, Germany! 1 batch Homemade German Spätzle can be made in advance and refrigerated until ready use, then let warm to room temperature before baking. Can also use a large bag of store-bought, but homemade strongly recommended. Butter a 9x13 (or a little smaller) casserole dish. Layer 1/3 of the Spätzle in the bottom of the dish followed by 1/3 of the cheese and 1/3 of the caramelized onions. Repeat, sprinkling each layer with some salt, ending with cheese and onions on top. 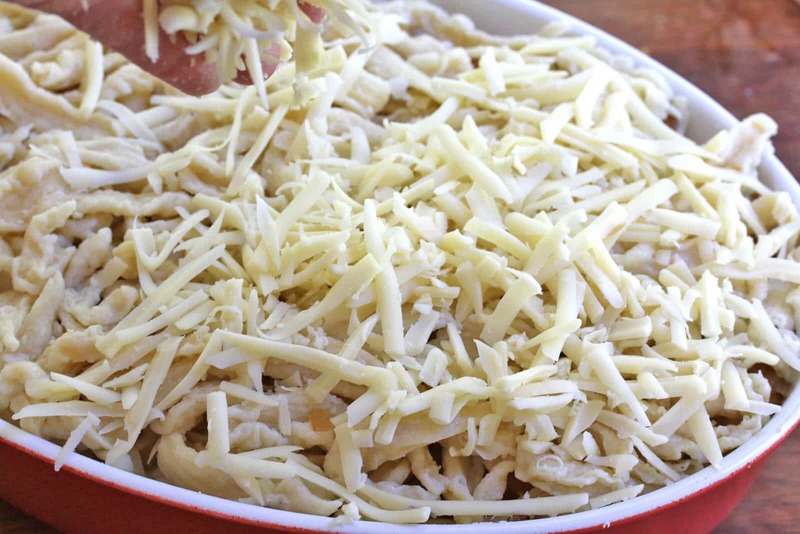 Bake for 10 minutes or longer until the cheese is melted and the edges are just beginning to get a little crispy. I love this recipe. I’ve had spätzle a few times, but never in a mac n cheese! This has to be amazing. What can I use as an alternative to spätzle I don’t know what it is ?! I’m with your sweet little girl–I’d want to eat this for breakfast, too. I look forward to trying this very soon. I’m down for any type of macaroni and cheese! Yours look positively delightful! Oh! 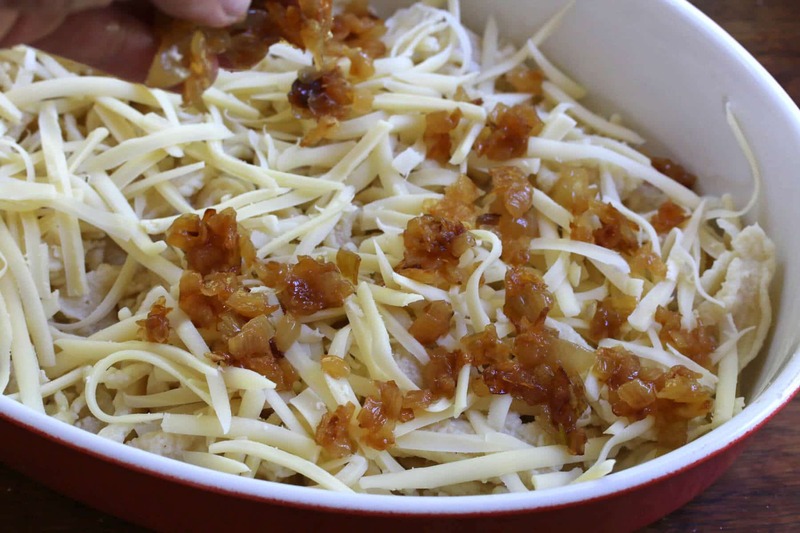 I just love the caramelized onions in this – how delicious! I adore spatzle and I can see why your little girl wanted this gorgeous cheese-y dish for breakfast! I think I adore your version WAY more!! SO delicious! Oh man I really want this mac and cheese! I love that it uses homemade spaetzle. There is so much love in this dish! my mother made what we called egg pancakes did not have the onion in them and we wrapped it in cucumber salad loved it. I’ve never been a huge fan of mac & cheese, but THIS!!! This is completely different! I can’t wait to try it! I haven’t had restaurant or homemade Spätzle before but I need it! Anything with cheese and noodles is right up my alley! Nein, Chris, ich hatte keine Ahnung! Obwohl “Scheuer” offensichtlich Deutsch ist. Very cool! You’ll have to tell me about your German heritage sometime and which part your family came from! oooooh man. All of that cheesy goodness!! German Mac and Cheese! I never would have thought to call Käsespätzle like that, but it fits! Funny! 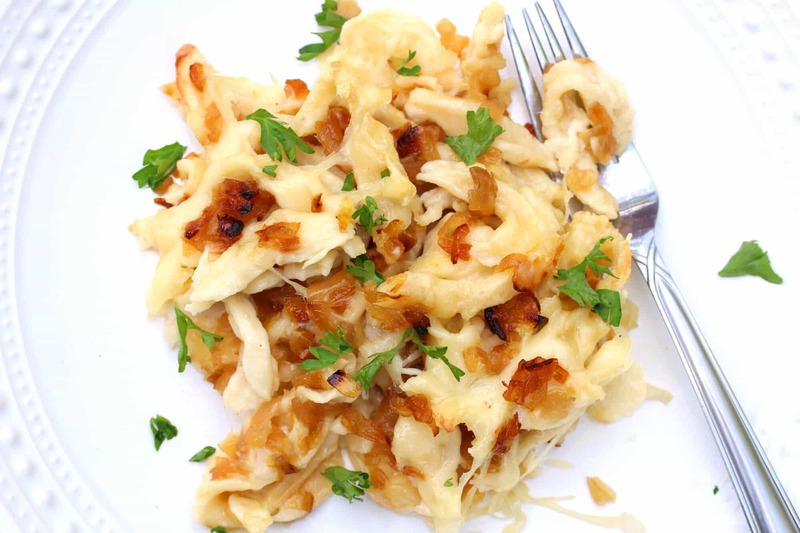 :) This is one of my kids’ favorite meals as well, I can never go wrong with Käsespätzle. Another homerun from the Daring Gourmet! For my birthday dinner I requested German food from my fiancé. Having tried several of your recipes in the past, she knew she couldn’t go wrong coming here for inspiration. This Kasespatzle was AMAZING! You are absolutely right, the onions are what really make it. We had this along with your Senfbraten and I was in heaven. My mother is an amazing cook and even she said it was one of the best meals she’d ever had. Great work! Kimberly, I have an all-day work meeting at a friend’s house coming up Monday and I wondered if I could layer the casserole Sunday and refrigerate overnight, take to her home Monday, and bake it there? It seems like something that can sit and wait, but it seemed worth asking first. Hi Valerie, yes you can absolutely do that and thanks for asking because I’m sure others will wonder the same thing. 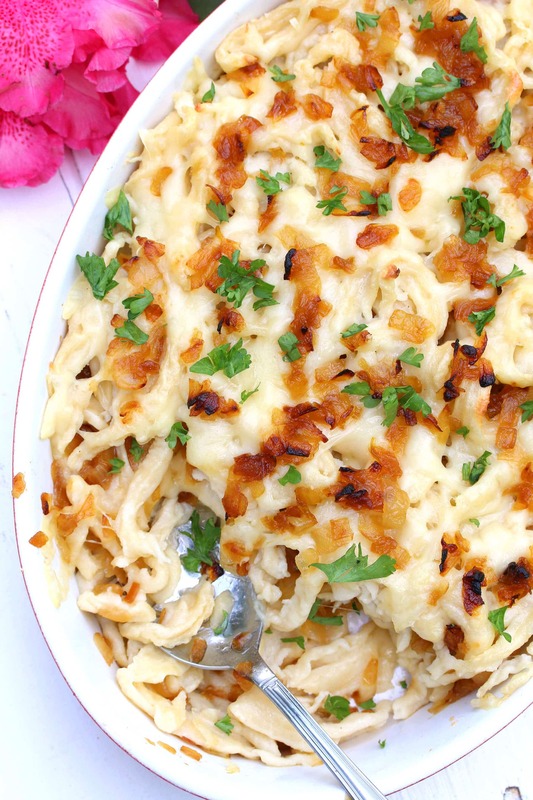 Happy cooking and please let us know what your colleagues think of the Käsespätzle! Gott im Himmel schemckt sehr gut! I made this for Christmas eve dinner and everyone loved it. My mother often made spatzle, but never added the cheese or the onions. The onions absolutely make this a hit, and as Kimberly says, don’t skimp on them. Although my heritage is German, I live in the southwest and make tamales every Thanksgiving weekend. I always considered them the ultimate comfort food, but das Kassespatzle ist jetzt der Konig. Not sure how to say “comfort food” in German. Gemutlich essen??? Vielen Dank für das leckere Rezept. Ich hatte es fast schon vergessen. Ich bin mit Spätzle und Zwiebelkuchen aufgewachsen. Komme aus Tuttlingen. Echter Schwabe aber lebe schon 60 Jahre in Kanada. Wie made the “Mac and cheese” with left over ham or bacon mixed in. Maybe my mothers variation. Thanks again. Hallo Kimberly, ich kommen von Heilbronn und bin ein echter Schwab. Sounds delicious! For kasespaetzle, you don’t sauté the spaetzle before layering in the casserole dish? It just goes in after the boil? Thanks, Mark! Correct, no sauteing first, just straight into the casserole dish after boiling. Happy cooking! So, if I made the spaetzle the day before and had it in the refrig, how does that effect the baking time? Or should I heat it a bit first? If so, how do you recommend heating? Keep up the beautiful work!! My husbands family is from Switzerland and we make a dish almost exactly like this but use elbow noodles and salt and cook on a double boiler for about 3 hrs. I have never seen a recipe so close to ours. We have always called them Swiss noodles. I am going to have to try the fresh pasta and baking it. Wow! Hello. This looks amazing and like something I would cook. I wanted to ask if a “regular” ricer would work? I say regular because I can’t change the size of the holes. They are around the size of thick spaghetti. Hi Omar, you’ll probably have a real struggle trying to get the dough through the ricer, I wouldn’t recommend it. My Dad was a cheesemaker and when he came here he made his with brick, Swiss and Limburger. It was also made on the stove top, not baked. The pan was not fun to clean, but it was so good! This recipe was wonderful! I’m new to making spaetzle so this was a real treat. I found that with the provided ratios, my dough was very thick (I hand mixed), so I added more milk until it moved better. Also, next time I will use way more onions, like 5-6. Amazing! Awesome, Josh, thanks! I’m with you on the onions, I can’t get enough of them either. 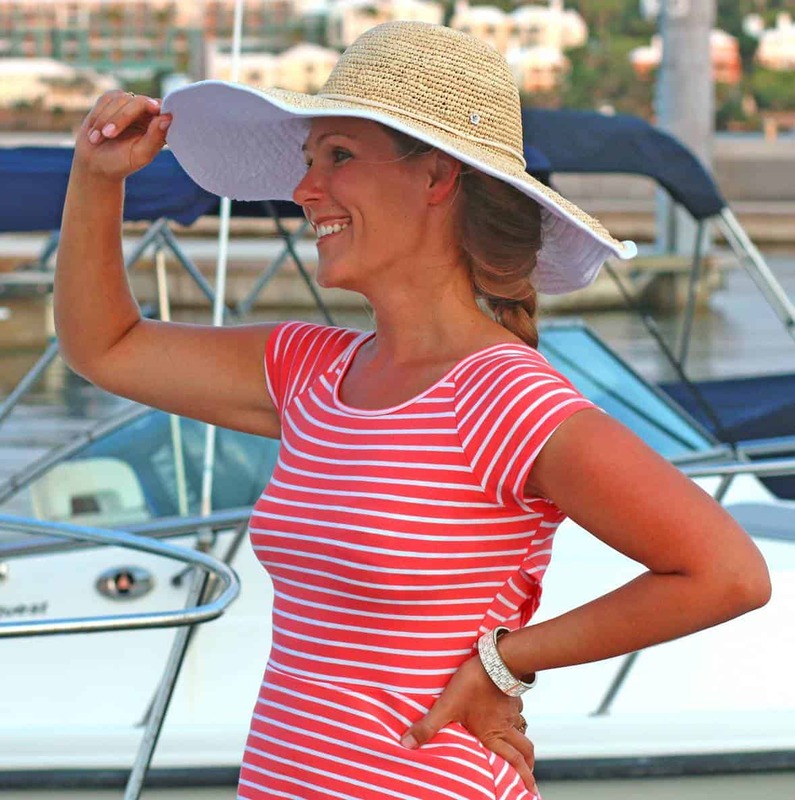 Hi Stacey, I’m so glad you found us! I agree with your son, this is my kind of comfort food, too :) I hope he and your family enjoy it! This stuff is pure heaven! I used your recipe to make the homemade spaetzle and then made this kasespaetzle. Absolutely delicious, everyone loved it, will definitely be making this again! I’m so glad you enjoyed it, Tammy, thank you! Vielen Dank, Ursula, es freut mich dass es Ihnen gefallen hat! Yes, all cheese is vegetarian as it contains no meat. Cheese contains rennet the inside of a calf’s belly, so no most cheeses are not vegetarian. Sorry. Vegetarianism lies on a spectrum, H, and many lacto-ovo vegetarians consider rennet acceptable to eat as it is not muscle tissue. You evidently don’t eat rennet and so have answered your own question: Knowing some cheeses are made without rennet you’ll simply need to select an Emmentaler, Jarlsberg or Gruyere that is made without it. Rennet /ˈrɛnɪt/ is a complex of enzymes produced in the stomachs of ruminant mammals. Chymosin, its key component, is a protease enzyme that curdles the casein in milk. This helps young mammals digest their mothers’ milk. Rennet can also be used to separate milk into solid curds for cheesemaking and liquid whey. In addition to chymosin, rennet contains other important enzymes such as pepsin and a lipase. Rennet is used in the production of most cheeses. The mammal’s digestive system must be accessed to obtain its rennet. Non-animal alternatives for rennet are also available. Sorry most cheese is not vegetarian as it uses rennet, which comes from calves. My apologies, H, many lacto-ovo vegetarians consider rennet appropriate to eat, I forgot there are some who don’t. If you do not then you’ll simply need to select an Emmentaler, Jarlsberg or Gruyere that is made without rennet. Thanks Kimberly, it’s just that a lot of people don’t know most cheeses aren’t vegetarian. Lovely food though, thanks. This is a family favorite! Excellent as written. Wonderful, thanks so much, Dana! Hi Kimberly…..this Saturday is my birthday and my daughter has about 24 arriving dt her place. I’m saying “thank you” by offering your kasespatzle and other “Oktoberfest” choices….and beers!!! I have read sooo much of your stuff! Can’t wait to begin the following! I am making this for a high school German class “food day”. Since I don’t have time to make the noodles myself I have ones I bought in the store. It would be very helpful if you could add approx how many cups or ounces of noodles your homemade recipe makes (or are in a serving) or how many ounces you consider a “large bag” to be. I’m going to wing it and adjust as needed but it would be helpful for others. I’m also going to break with tradition and prepare it in a crockpot – layers etc all the same – so it can be dropped off and warmed gradually before their class starts. Wish me luck! Hi Susan, thanks for the input. 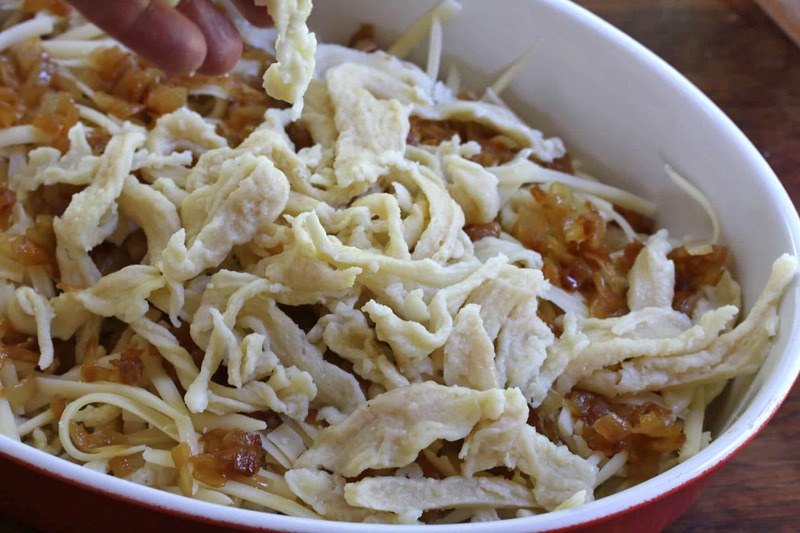 Fortunately this is a dish that really doesn’t need measurements – it’s simply a matter of layering the noodles, cheese and caramelized onions to fit in whatever size casserole dish you have (and as I said in my post, the more cheese and caramelized onions the better!). Good luck and I hope your contribution to the “food day” is a hit! This is exactly like my German mother in law’s “cheese noodles”. Do you happen to have a recipe for the potato dumplings? They were a family favorite and none of us have the recipe, we have tried many. I have a feeling you’re the one that can help! Hi Kristy! YES, I’ll be publishing my recipe for Semmelknödel (bread dumplings) shortly and will be posting the potato dumplings (Kartoffelklösse) in the very near future also :) Stay tuned! The first time I had Käsespätzle was with lunch along with Bockwurst and kartoffelknödel at an outdoor café on the shore of Lake Konstance in Lindua at the harbor with the Mangturm a stones throw away. The café was in front of Hotel Bayerischer Hof and my view was the lighthouse and Bavarian Lion protecting the harbor’s entrance. Now that I’ve reminisced about that 2 week visit to Deutschland, I fell in love with German “Mac & Cheese”. I’ve tried to imitate it several times and even acquire imported Emmentaler from my local German market and bakery down here in Lakewood, WA. But never quite hit the mark. The version I had didn’t have the bacon/speck but I tried this and it came out excellent, much better than the attempts I’ve made. I love your traditional Swabian recipes as that’s what I’ve had the most exposure to while visiting Germany several times. Danke Schon. Fantastic, Paul! Yes, adding the bacon is a must for sure. Lake Konstance/Bodensee…that was a favorite destination as a kid, we would take the ferry to the Insel Mainau, a fairytale place I always enjoyed exploring. Hess Bakery & Deli! I know it well, I used to go there quite often when I lived in the area and always enjoyed being able to chat in German with the women at the deli. My husband will still drive down there on rare occasions to get Weisswurst, something he loves and can’t find anywhere else. If you not aware of Blue Max Meats, they make a fabulous Weisswust. Just picked up 8 links yesterday. They have a shop, near Puyallup, on Canyon Rd north of SR-512 by a couple miles or their store in the Town of Buckley. They offer a few other traditional European sausages and cured meats as well as organic, grass fed beef, pork and poultry. Some smoked, some with rubs or marinate already on them or just naked. Oh and their traditional smoked pork chops, best I’ve had this side of the pond. Better than Ham! Speaking of Insel Mainau, I visited the Isle on my last visit in 2016. I totally agree with your description, it is a place where I do believe Fairies must live, so beautiful with all the gardens. I’m very lucky to have a lovely cousin and her family who love taking their American relatives to many of Germany’s fantastic places, and she’s a fabulous cook to boot. And yes about Hess, I too get to practice my limited greetings and words I know in German when shopping there. I’ve heard of Blue Max. I think I went down there once to get some hog casings for my sausages. Next time I’m down that way I’ll check them out, thanks. Have a great week, Paul! Hallo Kimberly, ich bin auch aus Stuttgart und finde es schön, dass du unsere tollen Gerichte in der Welt publik machst. Wenn du das Semmelknödelrezept einstelltst, erwähnst du bitte auch, dass man die übriggeblieben Knödel in dünne Scheiben geschnitten mit Butter in der Pfanne ausbrät? Das schmeckt so gut, dass ich manchesmal nur für diesen Zweck Semmelknödel mache. Eine andere Variante ist die Knödel aus Brezeln anstatt aus Brötchen zu machen. Hallo Gaby und vielen Dank! O ja, das stimmt, so hab ich es früher oft gegessen, super lecker. Ich danke dich, dass du mich daran erinnerst hast. Mit Brezeln hab ich es nie versucht – das klingt fantastisch, muss ich mal probieren! Nochmals danke! My husband and I lived in a little village called Baltmannsweiler for about 2 1/2 years a long time ago. It is in the Stuttgart area. I agree that that part of Germany had some of the best food in the country and in the world. I made your recipe tonight and it is the best one I have tried. I also made the hunter’s pork chops–delicious! I still dream about living in Germany. We loved our time there. I’m absolutely thrilled you made and enjoyed both of those recipes, Pam, thanks so much! Thanks for sharing. This is an incredible dish. I have this as much as possible when I am in Germany. Yes, I will have it several nights when I am on my vacation there. Some nice German woman while climbing the Ulm Church Steeple wrote the name on a business card and I just show it to the waiter when I get to the restaurant and see if they have it. Once in Rothenburg they did not have it on the menu but the chef made if for me anyway. It is sooooo good…. Like Macaroni and cheese on STEROIDS!!!! I love this dish and can’t wait to get back to Germany this summer. Really amazing country with so much to offer. The schnitzel and Bavarian pretzels and beer and apple strudel are also amazing!!! And pork hock. Agreed, Garrett, there are so many delicious dishes and Germany itself is absolutely breathtaking! Käsespätzle has always been a favorite of mine, it’s SO good! Im Allgäu wir essen Käsespätzle von nur eine große Schüssel im Mitte de Tisch. Alle hat eine Löffel und wenn’s Käsespätzle fertig ist (viele Arbeit!) dann Auf Geht’s bis alles weg sind. Ein guten Gurkensalat da zu mit eine Scheibe Schwarzbrot und unser Leben ist sehr gut. Meine Oma und meine Mutter hat immer de besten Käsespätzle gemacht. Gute Zeiten! Lecker!